Welcome to our review of the Govee Waterproof Wireless Doorbell, where we will be looking at the distance, melodies, volume, warranty, product features, and how to install it! 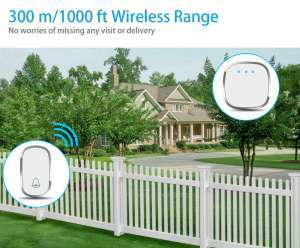 We have performed a large number of wireless doorbell reviews because we want you to get the very best wireless doorbell option for your needs. The Govee wireless doorbell is a standard, push and go wireless doorbell. It does not have anything fancy, such as video or WiFi integration, but it is great as a basic doorbell. So, let’s check out the Govee waterproof wireless doorbell! The Govee wireless doorbell works extremely well through a long range. The maximum distance you can reach between the push button and receiver is 1000 ft/300 m.
It is worth considering the objects between the push button and the receiver. Although the advertised range is 1000 ft, as the wireless signal passes through each object, it weakens. That could see a dramatic reduction in the working range of this wireless doorbell if there are many objects in between. Some wireless doorbells have increased power within the push button, such as the options on the long-range wireless doorbell page. If a wireless doorbell has a long working range in the open air, you know the transmitter is more powerful than other options. The wireless signal is transmitted on a frequency of 433.92MHZ. The Govee has 4 levels of volume, ranging from 25dB to 85dB. Although it is not the loudest wireless doorbell option, it is more than loud enough for you to hear if you live in a noisy environment. You also have the ability to turn the volume off completely so you can be alerted by the LED. This option is particularly useful if you have a Baby in the house who is woken up easily! Due to the LED, the Govee is a good option for those who are hearing impaired. Some wireless doorbells have over 50 chime choices, but in reality, you will disregard many of them before settling with your choice. The Govee wireless doorbell has 36 chimes in CD quality. 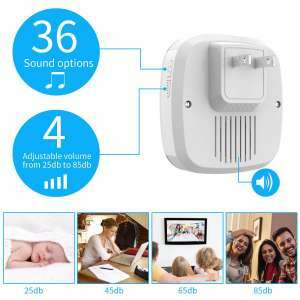 There are a number of childlike melodies, along with Christmas tunes and the classic ‘ding dong’, which is what most people seem to settle on for their wireless doorbell solution. The push button is rated IP44, which means it will stand up to rain easily. 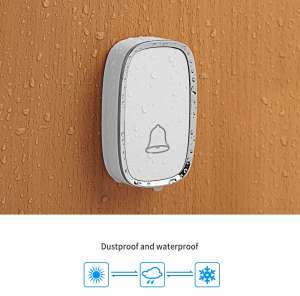 Although there are better waterproof wireless doorbell options, IP44 is good enough. Whilst the push button is waterproof, the wireless door chimes are not. Please keep them away from water as they need to be plugged into a power socket. As with most wireless doorbells, installation is super easy! Press the volume button (the second button) of the receiver for 3 seconds and hold it. the doorbell will enter pairing mode. Press the push button that you want to pair. After the pairing, release the volume button. As I said above, it is a very easy process! When installing the Govee wireless doorbell, you will no doubt notice the small size of the receiver. Many wireless doorbell options have a receiver that is too big and will cover more that one power socket. The Govee is different because the receiver is small enough to cover only one socket but big enough to hear it! You can also add more receivers to the solution by following the pairing instructions above. Installing the push button is also very easy. 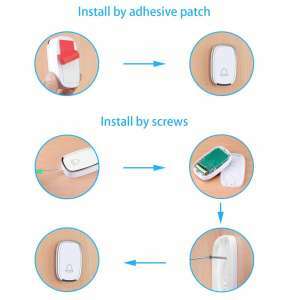 The wireless doorbell kit comes with adhesive, and screws. That means you have the option to use either, or both options. Personally, I have always used both the screws and the adhesive strips to secure the push button to the doorframe. There are reasons why you may choose one option over the other. For instance, you may want to use the adhesive strips because you do not want to damage your doorframe. The wireless doorbell kit has a battery included, which must be used in the push button. If you need a new battery, then this wireless doorbell uses a 12V 23A alkaline battery. 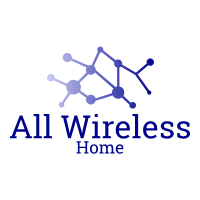 If you have any problems installing your wireless doorbell, then we have written a post that will guide you through the process. The best wireless doorbells have a long warranty, ranging from 12 months to 18 months. Govee is providing an 18-month warranty with their wireless doorbell option, which really shows how much they are confident in their own ability to create a safe, and reliable wireless doorbell. Not only do they offer an 18-month warranty, but they also offer free lifetime support for every product they supply. If you are having problems with this wireless doorbell then please contact Govee at support@govee.com. They are a very friendly support team and the response time is very good too. The Govee wireless doorbell is an awesome solution! The sound is excellent, the chime choices are vast and the 18-month warranty increases confidence that you are buying a reliable wireless doorbell. Let’s not forget about the lifetime free support too! How is that for confidence? The range is excellent too, with a working range of up to 1000 ft.
Can you improve the Govee wireless doorbell? Yes – we would like to see an improved waterproof rating to add in extra confidence when the push button is exposed to the elements. Along with the quiet setting, and the LED for the hard of hearing, we loved the fact that the wireless doorbell chime unit is small enough to cover only 1 power socket. This is an excellent feature, and is great if you are short on power sockets! The Govee wireless doorbell is an awesome solution! The sound is excellent, the chime choices are vast and the 18-month warranty increases confidence that you are buying a reliable wireless doorbell. Let's not forget about the lifetime free support too! How is that for confidence?